Home Basic File Questions Questions using library methods How to rename given file name in Java? Write a program in Java that rename's given file name. 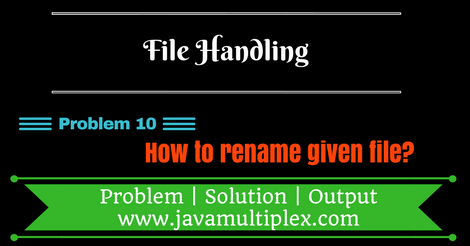 How to rename the given file name in Java? We need to use the following method of File class that is present in java.io. * package. public boolean renameTo(File dest) - It returns true if and only if the renaming succeeded otherwise false. * @problem How to rename given file in Java? // Regular expression for validating file names. Output - How to rename given file name in Java? Tags : File Handling, renaming file, if else, Scanner, String, File, renameTo(File), exists(), Regular expression, java.io.